Habit: Perennial herb 1--5 dm, matted. Stem: prostrate or ascending, rooting at nodes, well branched, +- glabrous. Leaf: opposite, < 5 cm; blade narrowly elliptic to subovate, entire, +- glabrous. Inflorescence: pedicel 0--0.5 mm. Flower: sepals 4, 1.1--2 mm; petals 0; stamens 4, anthers 0.2--0.4 mm; ovary stripes 4, green. Fruit: erect, 1.5--5 mm, +- oblong, minutely strigose. Seed: 0.5--0.7 mm, free from fruit wall. Chromosomes: 2n=16. Ecology: Roadside ditches, wet meadows, pond margins; Elevation: < 1000 m. Bioregional Distribution: w NW, n SN, c SNH, SnJV, CCo, SnFrB, SCo; Distribution Outside California: to British Columbia, eastern United States, Central America, northern South America; introduced +- worldwide. Flowering Time: Jun--Sep Note: Highly variable, often weedy. 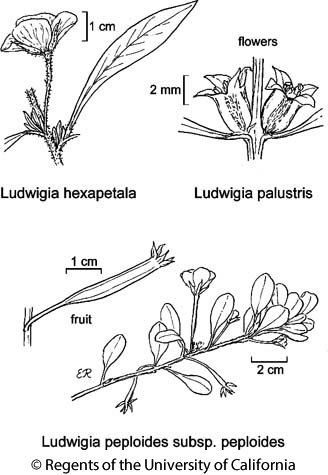 Citation for this treatment: Peter C. Hoch & Brenda J. Grewell 2012, Ludwigia palustris, in Jepson Flora Project (eds.) Jepson eFlora, http://ucjeps.berkeley.edu/eflora/eflora_display.php?tid=31651, accessed on April 24, 2019.
w NW, n SN, c SNH, SnJV, CCo, SnFrB, SCo; Markers link to CCH specimen records. Yellow markers indicate records that may provide evidence for eFlora range revision or may have georeferencing or identification issues. Purple markers indicate specimens collected from a garden, greenhouse, or other non-wild location.